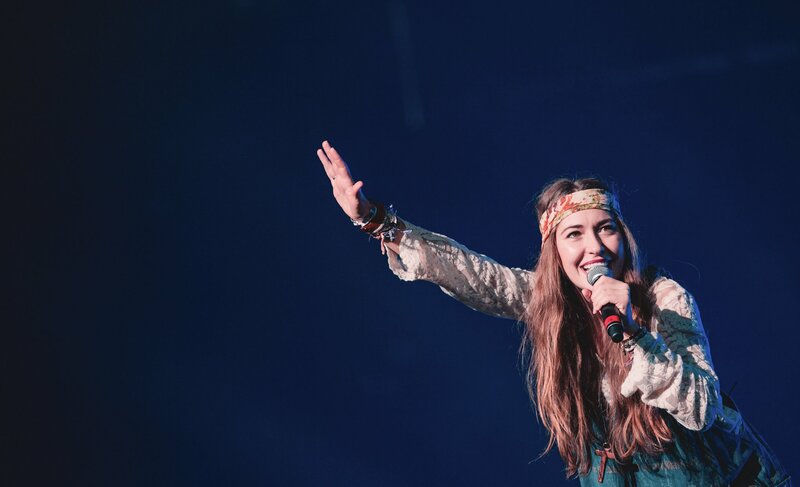 Lauren Daigle is quickly making her rise in the music industry. After winning the worship song of the year award in 2015 for her song “How Can It Be,” she also took home the new artist of the year award. She recently finished touring with Hillsong United and is rapidly becoming the next big thing in contemporary Christian worship. Her voice is a like a mix between Adele and Celine Dion and her personality in worship is both graceful and humble. Converge was able to talk to Daigle about her music, her inspirations, and why she loves to sing. You just toured with Hillsong. How was that? It was unbelievable. We’re about to go back out in July. I love it so much that I am counting down the days. They have poured into my life in so many ways. It’s so great to go out on the road with people who believe in you. Their support is amazing and I believe in them. We have the same the same calling, so that makes us battle buddies. Do you kind of feel like you’ve “arrived” now that you are headlining, or is it all still pretty new? Probably right in the middle of both. In playing in shows, in building and growing new teams I still feel brand new. But in other places—like being out on the road or when something crazy happens during the day—I don’t feel like it’s all new, it’s just par for the course, you know. But I have to admit, hearing my song on the radio is still pretty amazing. What’s the best and the worst thing about touring? The worst part is when you or someone on your team gets really sick. Being with these people all the time means that when one person gets sick, a lot of people get sick. So that’s no fun. But the best thing about touring is being on stage and singing and worshiping in the presence of God with all these other people. It’s an amazing feeling when all the walls are torn down and everyone comes together to worship God. So that’s a lot of fun—that and the meet and greet. I hear artists hate the meet and greet? No way. I get my energy from the Meet and Greet. I think I would be worn out if I didn’t have it. It’s where I get reenergized. Going on tour might look glamorous, but it can get really monotonous sometimes, and the VIP is really refueling to me and helps give purpose to my heart. Do you have any rituals or any game-day food before you go on stage? I’m drinking tea right now. I drink tea all the time. But when I go on stage I warm up with vocal coach. And I do a face steamer with essential oils and stuff. Are there ever times when the last thing you want to do is get up on stage and sing in front of thousands of people? I feel like there are moments of that, but I feel like the moments of that are when I am depleted and am sick or something. I don’t really ever go through moments where I feel like I don’t want to be up there. Every time I am on stage I get this rush that makes me feel like, “Ah, we get to do this together.” Like during WinterJam I got the flu and I couldn’t even sing, but it was such a special moment—something beautiful always comes out of it regardless of how I am feeling at the moment. How do you bring that attitude of worship to every performance? Because I need it myself. I can’t do anything. Worship is a place of the heart. Whether is it washing the dishes or taking your kids to school. But the Lord knows how important it is for us to unite in arms and sing praises together. I go through moments all the time when I am agitated or am tired and I just pray, “Lord, keep my heart posture pure. I just want to represent you to the best. I want you to implode on my life as much as you can.” So the heart posture is the primary thing. But I just take whatever I am feeling that day on stage with me and I ask God to get my heart back in check. So whether I am having a great day or am desperate for God, I take my story up there and live it on stage. Do you have a favorite city to tour in? I have a lot of places. Columbus, Ohio. They have this street called the Short North and it is just awesome. It’s quaint and I love it. Also this place called Portland, Maine. It is just incredible. It’s a small fishing village but it is this hidden gem of the United States. They have all these streets of old shops. I also really love California. I am definitely a West Coast girl. Why do you love to sing? I think honestly it’s being able to convey a message that everyone understands. Let me explain. So we speak English, but not everyone in world can understand English. Something amazing about sound is that when you create it, it evokes something in the spirit of every human. Music is integrated in every culture—whether that’s the jungle or in NYC. It’s in the fiber of every human on the planet. I remember when I was a little girl, walking around at five years old singing Celine Dion and Whitney Houston. They sing about love all the time, and even though I was five years old and didn’t even know what love was, I could feel it in a way that was overwhelming. This is what I love about singing. It can express emotions that are universally understood. If you could play at any venue in the world, where would it be? I just got back from Italy and it was unbelievable. But I stayed a few extra days and toured around. There was this one little city called Positano. It’s small and quaint and I would love to be able to do like an acoustic set in that city. If you could pay in any band, living or dead, which band would it be? Oh my gosh. Coldplay. I love Coldplay. They are amazing performers and they capture was the essence of what music is. So I’d love to be part of their band. Or I would really love something old school. I love the blues and jazz so singing with Louie Armstrong or Miles Davis would be amazing. If you were stuck on an island and could only bring 5 items, which five items would you bring? Five water bottles. Or five friends or family members. You wear a ton of bracelets, why? Do any of them have any special meaning? Well, I have worn bracelets like this before I was in the music industry in high school and college. It all started with just seeing something, picking it up and liking it, or people giving me gifts and keeping them as a memory. A few of my bracelets are from when me and my sister would go to festivals and get a bracelet every year. Some have more meaning than others. Jonathan Minnema is a grad student and editorial intern for Converge Magazine. You can follow him on twitter @jonminnema.